Be sure your firearm is unloaded before installing swivels. If possible the base stud should be placed 13" to 17" (33cm-43cm) forward of the trigger. Place the stock in a padded vice with trigger guard facing upwards. Then drill a countersink hole with a 7/32" (5.5mm) drill bit to a depth of 1/8" (3mm). Then drill in the same hole to a depth of 1/2" (13mm) with a 5/32" (4mm) drill bit. Insert the 1/2" wood screw base through a spacer washer and screw it into the hole using a drift pin punch, etc. Do not use the swivel to screw the base into the hole. Pull out the plunger sleeve and unscrew. Then press in the plunger and rotate the gate. Place the pin through the base stud eye. Then return the gate over the pin and release the plunger. Ensure the gate fully engages with the pin, and leaves no gap between gate and main swivel body. When in the correct position, screw the sleeve back, until the sleeve turns freely, indicating it is in the closed position. 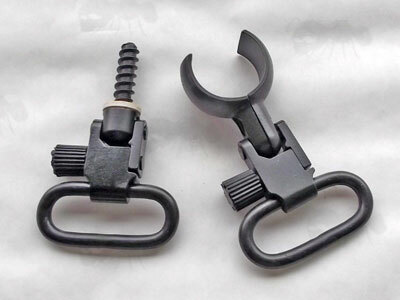 Sling swivels can be mounted in a variety of ways, depending upon your firearm configuration and your personal preference. Can be fitted to nearly all buttstock and forends. 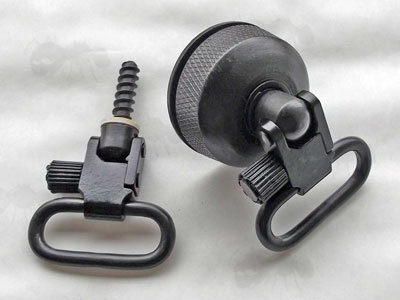 The swivels attach to the wood screw bases. 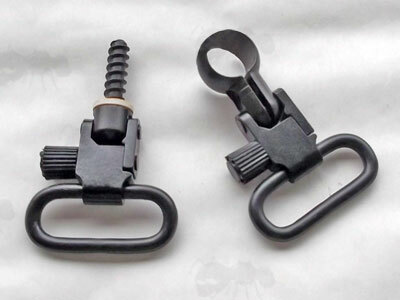 Can be fitted to nearly all buttstocks and forends, if the forends can accept 7/8" machine screw bases. 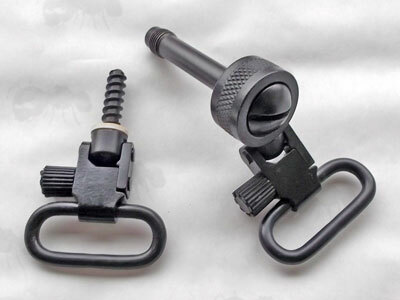 A partial band clamps to the barrel or magazine tube for easy fitting, without needing to dismantle your firearm. 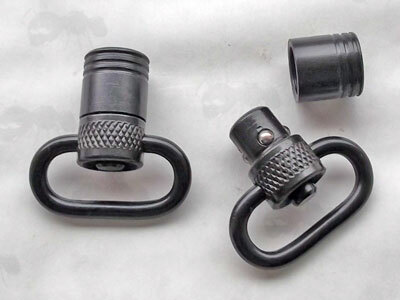 A permanent optionfor fitting to barrels or tube magazines. May require dismantling your firearm, gunsmith required. Simply replaces the foreend bolt. Simply replaces the factory mag cap on many shotguns. Can be installed to most wooden stocks. Leaves a flush finish when the sling is removed. 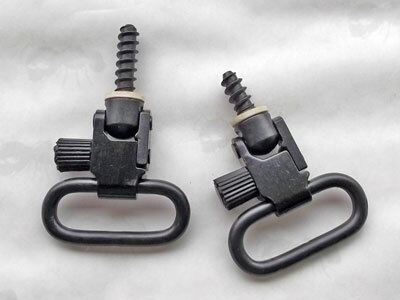 Be certain your firearm is unloaded before installing sling swivels. Firearm safety starts with you. Always follow these rules when using sling swivels. With QD swivels always make sure that the rotating gate is fully engaged on the pin, so that there is no gap. If not fully engaged it can become detached from the base. You should get into the habit of checking this each time you use your firearm. Climbing through hedge rows etc can amongst other things, catch on the sling or swivels. If the swivel becomes detached from it's base then your firearm could fall, causing damage or even the firearm to discharge. 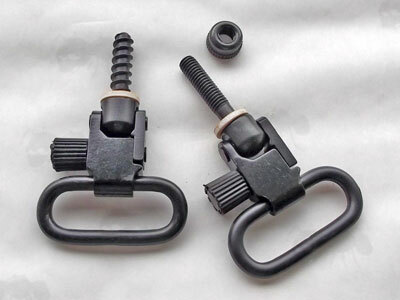 Sling swivels should be occasionally cleaned and oiled to prevent rust.